Our dogs are our companions and often viewed as extended family members. Therefore, when a dog passes away, many find that placing a memorial helps them with the grieving process. Honoring your friend can take several different forms including pictures, donations, and pet memorial stones. Here are just a few ways you can honor the memory of your beloved pet. 1. Place a garden stone. One option is to paint a paver and place it in your garden. 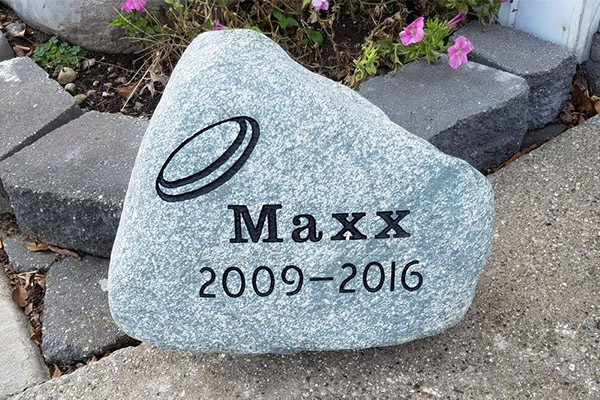 If you are worried that rain and wind will wear away the paint, then consider purchasing an etched stone from a local headstone company. Headstone companies can engrave an epitaph or have a picture etched into the stone. Granite is the perfect stone for this type of memorial. It can withstand the elements and comes in a variety of colors and finishes. Consider either a flat stone or a granite boulder. 2. Donate to the local animal shelter. Make a contribution to the local shelter in your dog’s name. Your gift could help another dog find a forever home. Shelters are always looking for volunteers, so also consider donating your time as well as your money. 3. Add memorabilia to your keychain. You can always add a small “charm” or piece of memorabilia to your keychain. Dog tags are a great way to carry around a reminder of your canine friend. Miniature photo frames are also available for keychains. You could even attach a small section of your dog’s collar. There is any number of items that you could carry with you in remembrance. You can purchase a plot for your dog at a local pet cemetery and honor your friend by placing a memorial stone at the gravesite. Invite close friends and family over to share favorite memories of your dog. Always in Stone designs custom memorials for pet owners. If you want more information on how you can order headstones or garden stones, come to our showroom or give us a call. We can help you with the design and we offer delivery to your pet’s resting place near Goshen or Elkhart, Indiana.